Guinea pigs are small, furry, round, and cute animals who are considered ideal pets because of their gentle and friendly nature. However, there is another characteristic guinea pigs are famous for. It is for having a starving hunger! 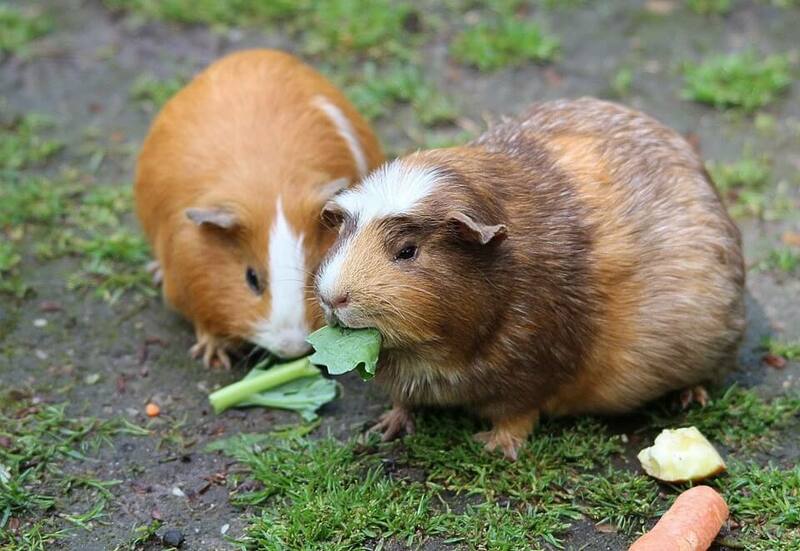 Whether it’s grass, pellets, daily greens or food snacks, cavies are always eating. As pet owners, it is where our responsibilities set in. With such an enormous appetite, it is up to us to know what makes an ideal guinea pig diet. However, deciding on food that is safe for this little furballs can be quite a challenge. So what can cavies eat? Which food is safe for them and which are not? To help you out on this, we have a list of good and bad foods for your little cavies. What Guinea Pigs Can’t Eat? The guinea pig’s most common diet is grass. Their molars grow continuously during their lifetime and are best suited for grinding grass. However, because they have longer colons than other members of the rodent family, they need to supplement their diet. Thus, they often eat some of their feces. It may sound gross, but they don’t consume their poops indiscriminately. Instead, they can produce soft individual pellets cecotropes. It contains Fiber, B vitamins, and bacteria for proper digestion. Like us humans, cavies cannot synthesize Vit.C on their own. For this reason, they need to obtain it from food. Without enough of this in their body, guinea pigs can suffer from scurvy, which is a severe and life-threatening condition. Poor diets of guinea pigs often connect with metastatic calcification, muscular dystrophy, difficult pregnancy, vitamin deficiency, and teeth problems. Having learned what is and is not appropriate to eat, Guinea pigs can sometimes be picky eaters. When it comes to introducing fresh fruits and vegetables, it can sometimes be a challenge, since their eating habits can be hard to change especially upon reaching maturity. In some cases, they would prefer starving themselves than trying on a new food. It is why introducing an ideal diet to your cavy at an early age is essential. So how do you know which food is best for your furballs? Below is a guide to help you out. A steady supply of clean, room temperature water is always a must. Just make sure that you clear the water bottles and also replace the water on a regular basis to avoid contamination. It is an ideal fruit to feed your cavies because of its high vitamin C content, which is essential for guinea pig health. However, because of its sugar content, it should be served in moderation. Once or twice per week would be ideal. Quality grass hays such as timothy hay provide the fiber essential for your cavies and should be available for consumption at all times. Without it, a guinea pig’s digestive tract can shut down. Aside from the fiber, grass hays also help prevent their teeth from the possibility of growing too long. It can also keep their little teeth clean. Bell peppers are great for guinea pigs because of its high vitamin c content without the dreaded sugar. Red, green, yellow, all varieties will do wonders by providing your cavies with loads of much-needed Vitamin C.
Pellets may be less important when compared to fresh hay, but it can provide nutrients which cavies cannot get from grass alone. It would be ideal to provide your pets with about ¼ to 1/8 of plain seed and corn free pellets each day. Also, it will be better to have it served in a ceramic bowl that is large enough not to tip over accidentally. It is another fruit that is packed with vitamin C, making it an excellent option for feeding your cavies. Just make it a point to remove seeds and safety proof before you serve it to your pets to avoid the chances of choking. Being a rich source of Vitamin A, carrots are always safe and ideal for your cavies to munch on. However, you should be cautioned not to feed your pets too much of it. Carrots are very high in carbohydrates and can be sugary. It can promote gas-producing bacteria that can cause digestive tract discomfort. It is probably the best choice of veggie to serve to your cavy. It is high in fiber, potassium and, vitamin C content. Leafy greens should constitute a big part of your guinea pig’s diet. They are safe for daily feeding except for iceberg lettuces which may cause diarrhea when consumed in high amounts. It is another green vegetable that contains high contents of vitamin c which makes it another ideal snack for your pet guinea. However, like everything else, the key lies in moderation. Parsley has high calcium content and if consumed incorrectly can produce bladder issues. Instead of feeding them every day with parsley, you can try to rotate it to your pet’s diet a few times in a week. While it is essential for a guinea pig owner to be guided about the best foods to incorporate to their pet’s diet, knowing which type of food cavies can’t eat is equally important to keep your babies from ingesting anything that can be potentially harmful to their health. Here again is a guide to help you out. The only food that is set up for guinea pigs to digest plants. They can’t assimilate meat and serving them even a little can make your pet seriously ill. It includes yogurt, cream cheese, cottage cheese, sour cream, and regular cheese. Again, guinea pig’s GI tract is not structured to digest anything but plants. Feeding them any dairy products can damage their system, and symptoms may take a while to appear. These can all lead to intestinal bloating because Guinea pigs can’t digest gassy food. This fruit is very high in fat, which can cause a lot of weight issues with your pets. This food can lead to life-threatening blood disorders. It is POISONOUS for cavies and should never be consumed by your pet at any cost. Can cause the formation of urinary stones. Very high in fat. Can cause obesity and weight issues amongst cavies. Knowing what should you include in a guinea pigs diet helps ensure the happiness and safety of your little rodent friend. It’s our duty as loyal pet owners to ensure their safety and well being at all times. It is an instinct for us to feed our little furballs with a variety of stuff which we might think are safe for them, just because they are safe for us. We need to keep in mind that much as we love them, they are still a different species with an entirely different pathological system. Being properly guided on what food our guinea pigs can safely eat will not only give us a lot of peace of mind. It is also a way of showing how much we love our furballs.